Why, yes, that is a small parrot sharing my dinner! A group of friends got together at a park and one of the men brought his parrot, Kiwi. Kiwi was on the grass while Emory went to the cars. When Kiwi started eying the chair Emory was last in, my husband sat down and Kiwi jumped up on his leg. 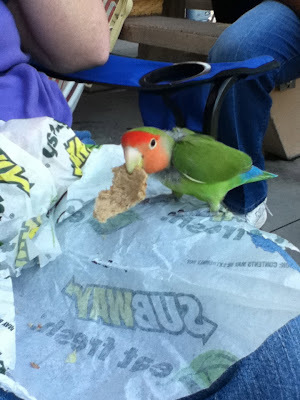 Husband asked for a piece of bread from my sandwich and as soon as Kiwi figured out that I had the bread, over he flew. Parrots are so funny! So much personality in such a little body. What a colorful dinner partner. Don't tell him he's not really a person. Clever and beautiful parrot, how fun! Enjoyed looking at the photographs! What a great dinner guest! Very cool photos, and a very unusual pet to take to the park, LOL. 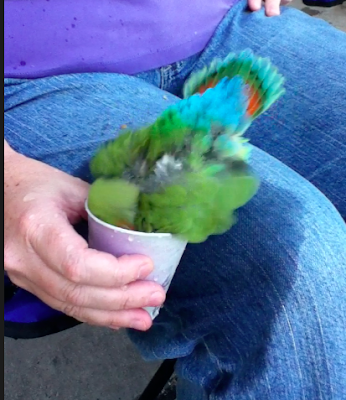 Oh, how cool to share your meal with a parrot! Great pictures! I've never seen someone bring a bird to the park. How unique! OMG I love this photo. How funny!